When purchasing all-terrain tires, there are a wide variety of variables you should consider: traction, braking, materials, ride comfort, and noise level, among others. When you’re looking to purchase an all-season tire, you want to settle on something that you know for certain can handle the dead of winter and deeps patches of snow and ice while managing to keep you safe. Our ever-changing weather landscape has brought about an emerging market that allows us to be prepared for it all. We know searching for a new set of tires for your vehicle can sometimes be an overwhelming experience. In this review, we are going to cover one of the best all-season tires on the market today. What is the warranty miles on these tires? What is the performance of these tires in ice? How many miles are these rated? Are these tires made in China? What is the quality control? Wet weather performance? Is this a set of four? Does this include a valve stem for the rims? How many miles of warranty? What is the traction rating? When it comes to high-quality traction and performance, the Milestar MS932 all-season radial tires take the cake. At a glance, tires all look about the same, but we know that they actually vary in performance and longevity. Knowing which tires to purchase depends on many factors, including noise, handling, grip, tread, wear, and obviously price. Many consumers want an all-in-one tire, and that’s essentially what all-season tires promise to be. It is no wonder that in the replacement tire market, all-season tire sales overshadow those of summer, winter, and off-road models. When judging all season tires, consumer reports look at several key performance factors, placing more emphasis on safety-related aspects including braking, hydroplaning resistance, and handling. Consumers of course want the best value for the price, but compromise is undoubtedly part of buying any new products, even tires. We feel the better models deliver a good balance of all-weather grip, handling, long tread life, and a comfortable ride. With the Milestar MS932, quality is the name of the game. Works Well with All Terrains – Whether you are driving on pavement, gravel, asphalt, mud, sleet, or snow, these tires will offer the traction and high-performance braking that you need when traversing inclement weather conditions. Longevity – It’s one thing to have tires that perform great for a few seasons, but these are tires deliver quality performance for an extended period of time. Keep these tires well-maintained with regular cleanings, and you will marvel at how well they hold up. High Value – In comparison to its competitors on the market, the Milestars stack up favorably. It is a product that will deliver you the confidence you need when making an investment in your automotive needs. Control – When you’re driving with these tires, it will feel like you’re hugging the road. You will feel confident in your control of the vehicle in all weather conditions. Careful with Your Vendors – Some customers have complained about the quality of shipping and delivery of this product. But with us, you won’t have to worry about that. We guarantee speedy and effective delivery for all of our products. All-season tires come in sizes to fit everything from small cars to light-duty SUVs and pickups. They are the most popular type of tire and are designed to handle most conditions, including dry and wet pavement and light to moderate snow. The Milestar MS932 is a product that matches up to the competition and outperforms even the best the market has to offer. Performance all-season tires provide year-round grip for enthusiastic driving. They are a step-up from regular tires, and they place more emphasis on handling. The company offers a 50,000-mile warranty, which should give you a great deal of confidence knowing you’ll be covered for likely several years. While no tire works perfectly on ice, these tires have shown to stack up favorably in a variety of weather conditions, including ice. They have been proven to last for years. In one case, these tires lasted 65,000 and still had 70% of the tread life left. These tires have a smooth grip and very nice thread pattern, and they handle well with a proper alignment. If you are tired of driving in downpours only to find yourself hydroplaning or if you are tired of feeling that your tires have zero grip under any conditions, this is the product for you. These tires are well-made and are about half the price of other tires. And still, they offer the safety your family needs when you’re on the road. With the Milestar MS932, the tread and siding (traction enhancing slices/grooves through the tread blocks) and tread pattern are well-designed. You’ll immediately notice the high quality of these tires. Sidewall rigidity (handling and ride) is comparable to many other tires. The tires are made by Nankang rubber, one of Taiwan’s oldest tire manufacturers. These economy tires are high-quality, reliable, and cost-conscious. You will be hard-pressed to find tires that perform as effectively for the price. 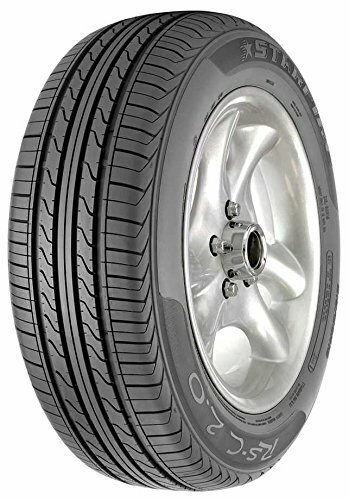 These are truly built to last, and if you treat them with care, you will not need any new tires for a long time. If you are ready to become a master of the elements, purchase a pair of Milestars today! When deciding what type of tire to buy for your car, there are a few different options depending on the model of your car, your personal preference, and the best fit for your lifestyle, especially if you are a car owner who likes to keep your vehicle’s tires clean and shining. With luxury cars, performance tires are often used because they have great maneuverability, grip, and traction.They are also designed to complement the high-end design, and they are more likely to hold up in various weather conditions and wear down more slowly than standard tires. For this reason, many people choose to purchase all-season tires to ensure that their vehicle has not only the best maneuverability but also durability. 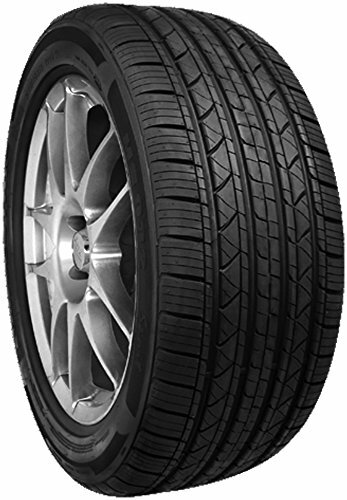 Goodyear is a well-known and reputable brand, and the company’s tires are generally regarded as dependable. Its all-season tires are no different. These tires are uncompromising and have shoulder tread blocks for increased cornering grip. They possess asymmetric construction for enhanced handling and ride quality during straight driving. The tires also possess wide lateral grooves for improved wet traction, and they are reliable in all driving conditions year-round. All-season tires are broken down into several categories depending on their blend of performance and traction: standard, grand, touring, high performance and ultra-high performance. Basic all-season tires traditionally carry S and T speed ratings, which can be appropriate for sedans and minivans. These are generally dependable tires with good overall tread life and good road manners under most driving conditions, including light snow if you live in an area with snow accumulation. Long-Lasting Tread – The biggest consideration when evaluating a new tire purchase is the tread, which refers to any rubber on the tire up until it meets the sidewall. The tread on this tire will make you confident in its dependability. Tread Lug – Another part of the tire that Goodyear nails is tread lug, which refers to the raised portion of the tire that sticks out and hits the road while driving. Tires include many designs that are different shapes, sizes, and material (rubber compounds). Manufacturers will spend a lot of time designing the optimal construction for certain effects. Durable – These are tires that are built to last for well over 40,000 miles. If you drive responsibly and keep them in proper maintenance, they are certain to last much longer. These are not tires that will be breaking down soon after your initial purchase! Great Value – These tires perform well under all circumstances, but they also won’t break your budget. Shaky – Some customers have complained that the product is “shaky,” causing vibrations throughout their entire car. Make sure that the tires are the proper fit for your vehicle. All-season tires are highly recommended for the majority of drivers because they are a middle ground between summer and winter tires. Although they are not as specialized, they are preferred for most customers because of their versatility and reliability. Unlike winter tires, they are not made to handle extremely low temperatures, slush, deep snow, or black ice because their sipes are narrower. They are slightly larger than summer tires, so they do not provide the same steering or cornering benefits. Their in-between design is better-suited for moderate weather conditions and generally last much longer than specialty tires. The Goodyear radial tire includes everything that you are looking in an all-season tire. All-season tires tend to be the most popular choice because they provide the best support for a longer period of time. The tread life is usually much higher because they do not wear down as fast when the road conditions vary. The best all-season tires depend on your personal preferences and needs as a driver. There are a number of different factors you will want to consider before finalizing your purchase. Luckily the Goodyear radial tire is an all-star product that will make your decision easy. The given price is per tire. Rims and valve stems are not included with the tire. They warranty rating is for 40,000 miles. 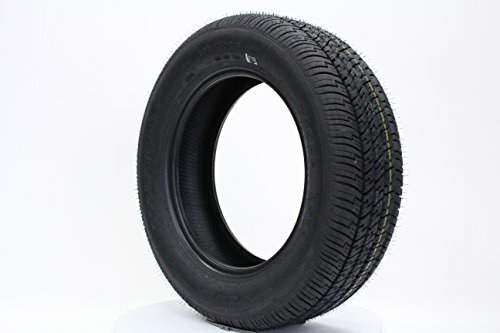 These tires are showing the UTQG rating for the tire to be 240AA. The 89 equals the load rating of a tire, which is 1279 lbs/580 kilograms for the tire. H equals the speed rating of the tire, which is 130 mph/ 210km/h for the tire. When looking to purchase a tire, you have to factor in the technology and design of the tread, including the types of tread patterns, performance, and how long they last. You have to understand the UTQG specs (traction, tread wear, and temperature grade), the manufacturer warranty, and expected value. When measuring up all of these factors against the competition, it is clear that the Goodyear radial tire stacks up favorably. If you are looking for an all-in-one tire that can effectively handle all seasons under moderate conditions, this is the product for you. 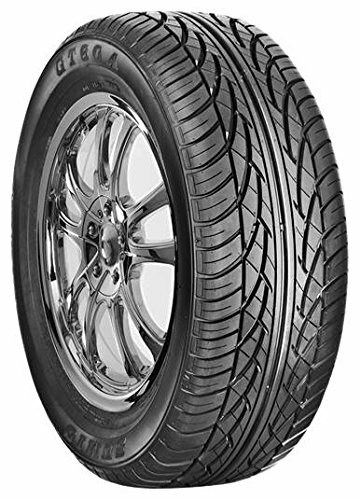 The Goodyear Eagle RS radial tires are not only affordable but reliable as well. Drive with confidence knowing that you have one of the best tires on the market to deliver you the quality maneuverability that you need to keep moving forward. These tires offer sustainable and reliable traction that is built to last. The first thing we’ll say is that although these tires do perform year-round, take things more carefully in the winter as performance is reduced. Tested throughout the year, the Sumic step up to the plate on the handling front giving you a nice tight ride with plenty of grip on the corners. You won’t notice much by the way of road noise until you hit higher speeds. At this point, you’ll experience a fair amount of whine but there’s always some sacrifice to be made with budget tires so crank up the stereo and let your new subwoofer drown out the sound. The tread is reinforced with a pair of steel belts which serve to strengthen the tires while also prolonging their lifespan. While the Sumic GT-A is undeniably a budget tire, this all-season workhorse is pretty durable and offers surprisingly strong handling and cornering given the price point. With little road noise at lower speeds and a nice ride quality, if you’re looking for cost-effective tires that will serve you well year-round, the Sumic are hard to beat. Stepping up to the pricier end of the tire spectrum, Bridgestone is a name you can trust and the Dueler brings all the expertise of this industry titan to the fore. Designed to work well whether the road is wet or dry, these versatile boots give you confidence year-round. The standard steel belts give added reinforcement while the sidewall filler minimizes any vibration. Bridgewater has an unassailable reputation when it comes to tires and the Dueler is a fine example of why this company continues to thrive. 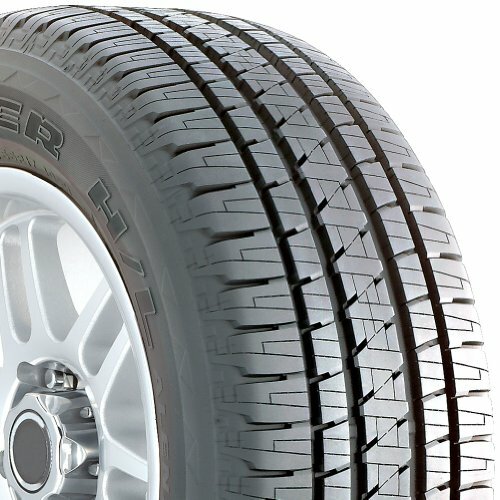 The tread design is such that you’ll get impeccable grip in both wet and dry conditions. The silica compound helps to boost traction when the going gets slippery. Even when you put your foot down, road noise is kept to a bare minimum so you can ride in comfort without that irritating whine. These tires work particularly well on large 4x4s and SUVs so treat yourself to the best and give your ride the shoes it deserves. The lower end of the tire market is a competitive place and Cooper serve up a boot that punches above its weight with the Starfire. Equally comfortable on wet and dry roads, you can put your ride through its paces year-round without fearing a loss of traction. You will get fairly little road noise from these tires but you should note they deliver a hard ride not to everyone’s liking. When you’re navigating the minefield of cheap tires, there’s always some sacrifice to be made to achieve that price tag. With these Cooper tires it comes in the form of a hard, bouncy ride. And that’s the price. You can kit out your whole car for the price of a single Bridgestone so some minor downsides are perfectly tolerable if you’re operating on a tighter budget. While designed for use in all weathers, the Cooper come into their own in wet conditions with all water neatly eliminated due to the wide grooves in the tires.